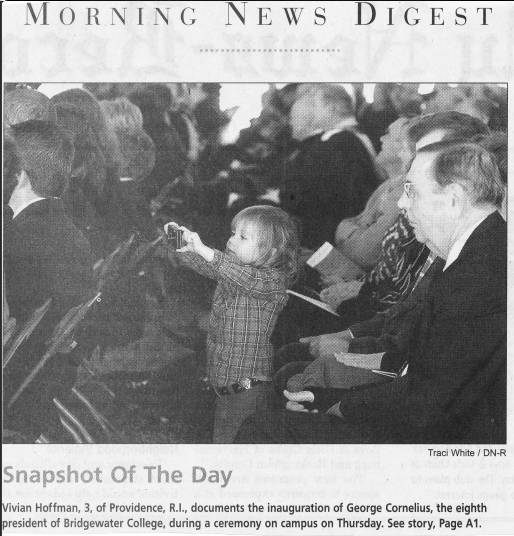 Last week Vivian and I flew down to Bridgewater College for Uncle George's inauguration. I have to say I thought his speech was quite good. It included a number of elements I recommend for impressing me. Finally, this day is possible because of the support and love of my wife, Susan. She is a smarter, better person than I. For nearly forty years, I have been greatly blessed by her presence in my life, and now this community is blessed as well. The year was 1880. The country had just suffered through the harsh six-year Depression of 1873. Moreover, wounds of the Civil War had not yet healed. Here in this very valley, memories of death and destruction were vivid. Parents and widows still grieved over their dead sons and husbands. Men awoke daily, tormented by memories of earlier times when they were whole—before arms and legs fell victim to the surgeon’s saw. An entire race was struggling to finds its way in a still hostile world, trying to understand why freedom turned out to be such a heavy burden. Time—possessing, as it does, the power of healing—and love—being slow, as it is, to overcome institutional hatred—had not yet finished their work. This stretch here elegantly, well, it does a lot of things, to frame the community, George's deep ties to it, and the expansive vision he will elaborate throughout the speech. Bonus points for quirky historical quotes referencing my home town. A peculiar people lived in this valley. They were peculiar in dress and custom. They were peculiar in thought as well. Their ancestors had been drawn to this continent in 1719 by the promise of freedom of thought and practice, and by possibilities. They first came to Philadelphia. Later, these German pilgrims fled west as their principles of nonviolence turned others against them at a time when men took up arms against a distant monarch. They settled in Lancaster County. Others moved still farther west. The great valley beckoned them—the valley known in the north as Cumberland and in the south as Shenandoah. Here they settled. Here, the mountains provided sanctuary, keeping a hostile world at bay. They were a simple people. Most were farmers. They toiled the land, reared their children, and, above all, sought to walk in the Way taught and lived by a Palestinian Jew named Jesus. From their midst arose an evangelist who was not content with the toil of hands. At age twenty-four he embarked on a journey to teach Greek and German to students of the Brethrens’ new Normal College in Huntingdon, Pennsylvania, just a short distance from the place of my youth—a school that later would become known as Juniata College. “The Huntingdon experiment looks like a good idea for Virginia,” wrote Daniel Christian Flory. Unfortunately, a funnier quote from critics who were afraid students would come back from Huntingdon as "cane-twirling dudes" was left on the cutting room floor. The values that comprise the Bridgewater Experience, at first blush, seem quaint and old-fashioned. Perhaps we are simply behind the times. Initially, one might even suspect it is merely a façade. But then the authenticity and power of these values and this culture become apparent. And after a while you begin to realize that something is present here that the world desperately needs. The values that our ancestors have generously passed onto us are precious and increasingly uncommon: the college’s attention to developing the “whole person”—that is, the mind, body, heart, and soul; to exploring what it means to be human and to live a thoughtful and purposeful life; to aspiring for wisdom and not merely knowledge; to nurturing an inclusive and caring community in which love-informed giving, and not self-centered taking, is valued; and to serving something greater than ourselves. Great societies like China have advanced with lightening speed. Talented, highly educated people from Asia, South America, and Eastern Europe now compete with our sons and daughters for the best jobs. No longer do America and Western Europe have the world’s economic stage to themselves. Lay out a nice succinct plan based on the above, pointedly avoiding easy (and particularly technological) fixes. Time does not permit full amplification of all the steps we can and will take to enhance the Bridgewater Experience and student outcomes; however, there are two deserving of attention due to their criticality: diversity and internationalization. Both bear on the necessity of providing an adequate global context to our students’ intellectual development and career preparedness. Trustees, faculty, and staff who have heard me speak of this know I am speaking in the broadest terms possible. Principally, I mean diversity of experience, culture, and perspective. While this certainly entails greater racial and ethnic diversity, it is broader than that. In general terms, it is the intentional formation of a learning community comprised of people who have experienced life differently and, as a result, bring different perspectives and ideas to bear. It is a place where ideas arrive via different avenues and streets. It is a place that helps prepare our students how to work, how to deal, and how to get along with other people, including people who are different. And it also is a place where the color of one’s skin does not define the individual, or limit his or her possibilities. Today over 90 percent of our student body hails from one of two states. That needs to change. Today we have only five international students. That needs to change as well. A goal of more than 100 is not unreasonable. In addition, we need to do a better job of recruiting, retaining, and graduating more students from underrepresented groups. We also need to do a better job of recruiting and retaining faculty, staff, and senior administrators from underrepresented groups. Keep your arguments about technological and social changed rooted in your values. I am not naïve. While many have voiced support for this initiative, I know some members of the BC community may be concerned. Some may fear the loss of that which they value the most: BC’s strong sense of community. Bridgewater students are “nice,” is a common refrain around Rockingham County. I sense among some the fear that people from outside the valley may not be so nice. That is understandable; however, it underestimates both the source and strength of that which makes this place so special. The Christ-values of compassion, respect, generosity, and integrity, as well as a deep yearning for justice and equality, have withstood the test of time; they are not as fragile as some may fear. In any event, a community that is truly formed and informed by the values of Jesus cannot be defined by mountains. Barriers, whether natural or the product of man’s fears, have no place in such a community. Because we care deeply about our students and about helping them fulfill their possibilities, and because we care deeply about the world and its inhabitants, we are compelled to prepare our students well for a society that is global and diverse, and we are compelled to welcome to this community people who are different. Given our faith tradition and the concern some may have over what we call “Christian values,” it is important to note that “different” also includes people who reject faith in a divine being, as well as those who do not know what to believe. It is precisely because this institution is rooted in the values of One whose principal trait is love that all are welcome who seek knowledge and truth in the context of an inclusive, respectful community. For it is in our dealings with each other, and in our common pursuit of knowledge and understanding for the betterment of all people, that we are joined in community. And show a little class consciousness! While we go about the task of enhancing the student experience, we must be attentive to our special role in being a college for working people. 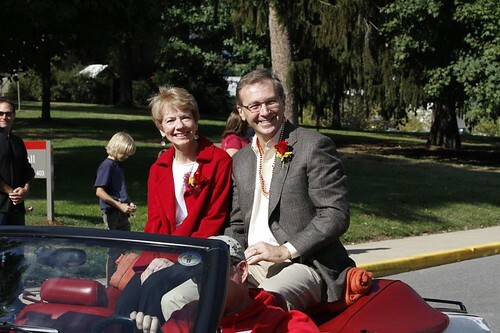 Bridgewater College is not an institution of hierarchy or privilege. Many of our students’ families are of limited or modest means. A large percentage of our students come from rural areas or small towns. More than a third are the first in their families to attend college. Quite a few come from high schools that have not prepared them particularly well for college. Educating the non-elite is a mission we warmly and enthusiastically embrace. We are not, and do not want to be, a place motivated or defined by rank and privilege. Frankly, that is not what Brethren values are about. Nor is it what the world most desperately needs. Overall, George seems to be taking to his new role like a duck to water, and Bridgewater is lucky to have him. I'm looking forward to seeing how they grow together in the years to come.